Dashboards continue to get a lot of attention in most organizations, Not just because of their visual appeal but they help organizations communicate strategy, monitor and adjust the execution of strategy, and deliver insights to all. Let us break this into simple terms. Dashboards, in the most simplest terms is a collection of different reports, all in one page or view. Now let us tune this statement. These reports in the dashboard contain high level summary information rather than detail transactions. For e.g in traditional reports, you see a detail listing of orders or invoices with neat formatting, totals and sub-totals whereas the reports in dashboard mostly contain aggregate information such as total orders for current month, total invoices for current month, profit for this month, total cost for this month. If you notice, the common term here is total (sum, aggregate, or high level) view. Now you may show these numbers as they are or canvas them in beautiful charts. Once you have your base information that you want your users to see, you display them in an appropriate format on the dashboard. Some information is better suited to be in tabular and some can only make sense in a Line chart or Stacked bar chart. Now smart companies want to grow their business and one thing they often ask is How did we do and How can we improve? So they try to attach goals to these numbers. For e.g If last year in July, if the total Orders were 10,000 and if they have been growing at 30% rate historically then they would like to see a 30% jump in the Total Orders for July of this year. This is known as “key performance” monitoring. They would like to visually see if total orders reached the goal or not. 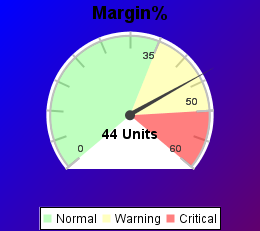 One way to visually see this is through a Gauge where the indicator can clearly indicate if it met the goal or not. If the indicator is in Green then it met and if it is in Red or yellow then there are some issues that needs to be investigated. So when something is not right, users would like to know more about the details. This act of finding more details is known as “DRILLING”. In the Drills users would like to see a detailed listing of all the orders or some other information so they can investigate. In a nutshell, your dashboard becomes your first interface to the information in your system and hence it is very productive to the end users for their analysis. To get a feel of dashboards, try this Dashboard Designer, you download it and it will launch a pre-defined dashboard based on sample Excel data. You feel right at home with once you see the dashboard in action.